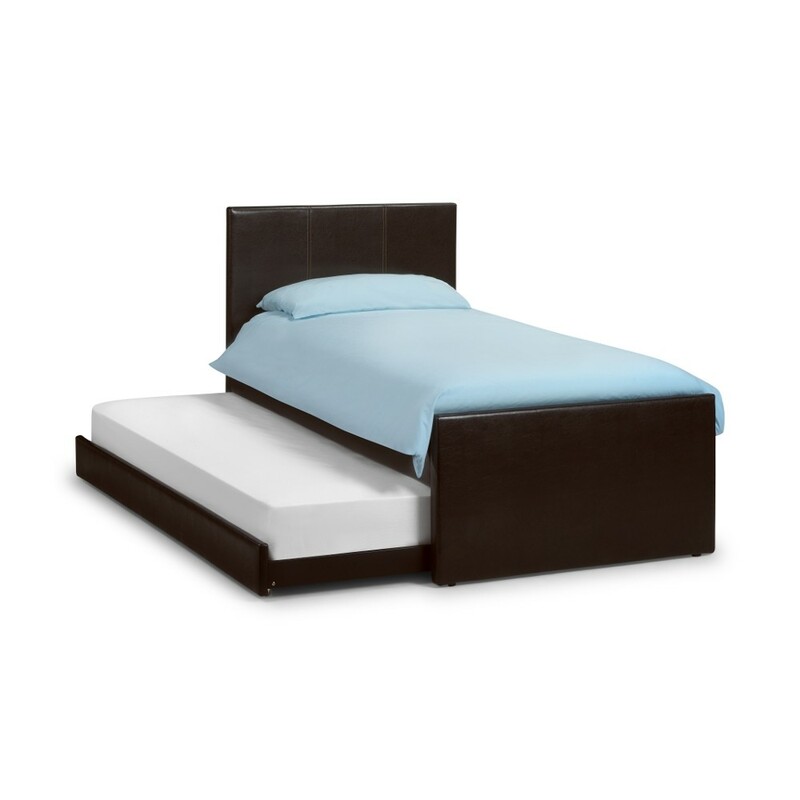 The Cosmo brown leather guest bed and trundle is a space-saving 3-foot single bed suitable for any room in the house. This is an extraordinarily simple yet elegant guest sleeping solution with bags of modern charm. The shape of the frame is relatively humble and traditional, but wrapped in ultra-chic faux leather material for extra quality and indulgence. This is then finished with a beautifully bold and rich brown colour that will match any décor within your property. Without doubt, the most noticeable feature of this guest bed is the tall headboard. It looms over the rest of the bed and features a delicate stitched design. This contrasts with the low foot-end to provide a greater sense of space – which is perfect for a guest room. This is especially true if you rarely host overnight guests and need something that is temporary without taking too much room in your house. The trundle bed pulls out very easily from underneath the main guest bed. It rests on castors so it rolls out almost effortlessly. This is a great option for when you have unexpected visitors and require emergency sleeping arrangements. Just pull the trundle bed out, throw on some sheets and pillows and there you have it – a comfortable and stylish sleeping space for two people! The best part about the Cosmo brown leather guest bed and trundle 3ft single bed is that it will suit both contemporary and traditional settings. There aren’t many places in the house this bed wouldn’t suit in all fairness! Why not try it for yourself? The slats on the Cosmo Guest Bed and trundle are sprung slats. This means they have a curve to them that helps in their sturdiness and also gives a bounce to the mattress. They are very high quality. Can the trundle bed be the same height as the main bed so as to make a double bed? The Cosmo Guest Bed's trundle does not raise to the same height of the main bed. The Cosmo Brown Leather Guest Bed is covered under the 5 year Manufacturer's Guarantee so any problem with the product that is not caused by normal use will be covered. For more information please contact CS on 0 333 444 0180. The picture shows the second bed being pulled out to the left. can this be reversed on assembly? so it comes out to the right? The Cosmo Leather Guest Bed can be configured during construction to make the guest bed drawer to be accessible from whichever side you wish. What are the dimensions of the bed when it is fully opened/extended in a double bed configuration? The guest bed is not attached to the main bed in the Cosmo. The main bed's width is 98.5cm and the guest bed is 94cm wide so to fully extend the guest bed and placing it next to the main bed you could need 192.5 cm.